We woke up this morning around 7am, needing to do laundry we set to task. We were lucky there was a laundry-mat within 50ft of the hotel. We grabbed some coffee, with weekend cream, from the lobby and walked over. Not only was the laundry-mat inexpensive, it was equally quick. While we waited we worked on the blog. We were a couple days behind because the mouse on the laptop died; quite annoying. We had no plan for today, but had the idea we might do a movie/television tour. We had looked prior to coming but we were stuck on the price. They ranged from $40 - $65; quite a bit for only a couple hours of entertainment. 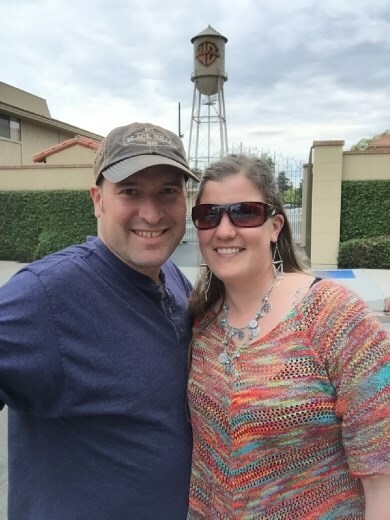 We decided on Warner Brothers for two reasons; first, they had a military appreciation discount; second, they only tour about 180 people a day. Unfortunately they were the high end of the price range. We've said it before, LA is expensive. One of the main reasons we picked our close to crap hotel was for price. The sacrifice was location; albeit it is 'closer' to everything than the last time we were here. 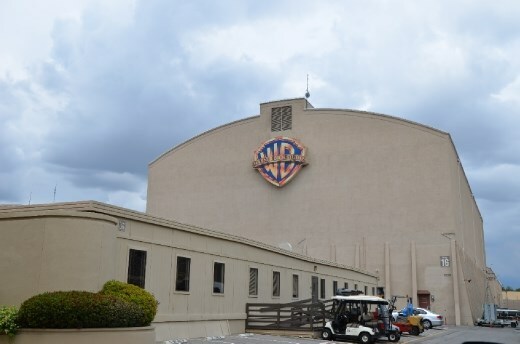 WB studios is about 24KM (18 miles) from the hotel. The drive this morning wasn’t terrible, but busy for a Saturday morning; typical LA. We stopped at Best Buy to get a mouse to catch up on the blog. 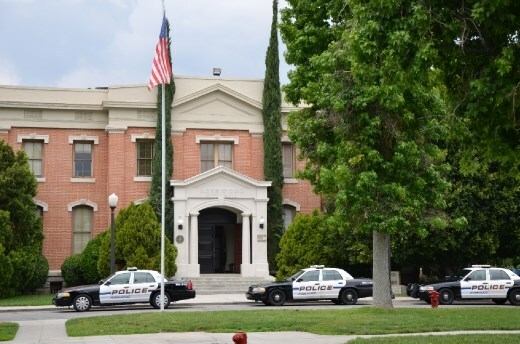 Surprisingly, it only took about 40 minutes to get to the Burbank area; where WB Studios is located. The tour information indicated parking was $10; which of course meant Tim wanted to find free parking. Surprisingly he did and only about a 5 minute walk away (keep in mind it is Saturday; same parking is not available on weekdays). We had a few minutes to kill and it was approaching lunch. We played it safe and got some Subway. 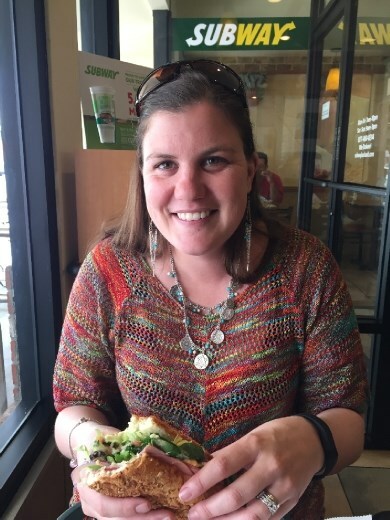 After Tim hounded the poor girl for more toppings, we ended up with salads between bread. I would say it was good, but I would have been OK with just mustard and mayonnaise on my cold cut trio. After the short walk to the studio, we took some pictures and entered without issue. 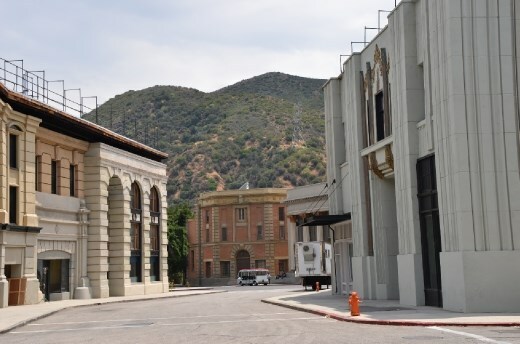 We watched a short video - hosted by Ellen DeGeneres - about the history of the Warner Brothers Studios. You can read about their history here, but it is enough to say that its old, and big. One of the draws for us was the tour is by 'golf cart', they have a large back lot and they allow access to many active studios. 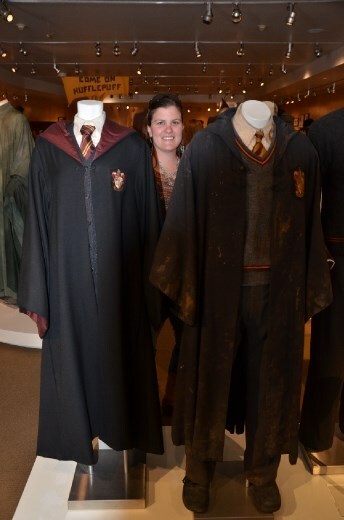 Our tour guide – Amanda – was very friendly and seems to have worked at the Studio for a while. She was very knowledgeable, but clearly had a set tour. We started by going to the back lots; mocked up towns, cities, etcetera. 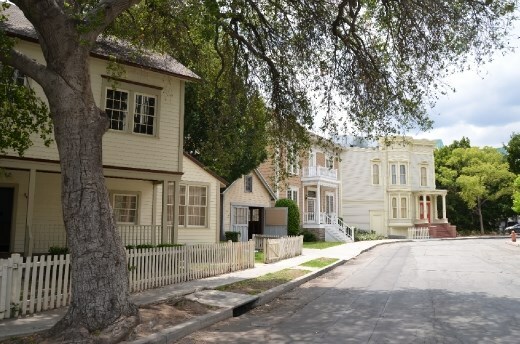 The main theme seem to be small town America where it seemed hundreds of movies, television shows and movies were filmed. 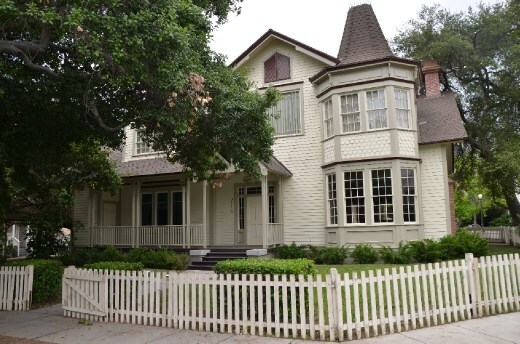 To name a few that were committed to memory, we recognized Friends, Gilmore Girls, Rosewood, Growing Pains and various 'cut-scenes' from videos (Rascal Flatts) to movies (Gremlins, The Mask). It was a surreal feeling; everything was fake, but so real. Buildings were one thing on one side (a police station) but something else on the other (high school). Another thing that was immediately noticeable was these buildings only had a single usable floor and there was no fixtures; no door knobs, lights, blinds etcetera, etcetera. If there is a second floor, it was fake with a landing at most. These building are essentially blank canvases that are customizable to the needs of the production; more on that later. 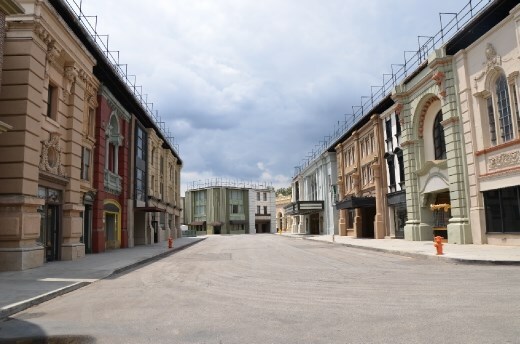 The back lots also had full city blocks that were recognizable from the Man of Steel, Argo and Batman (just to name a few). Incredible especially considering it was all fake. 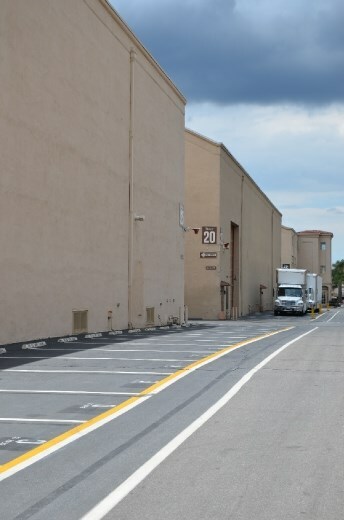 We moved on to sound stages which are basically warehouses that have been wrapped in cotton to be mostly sound proofed. 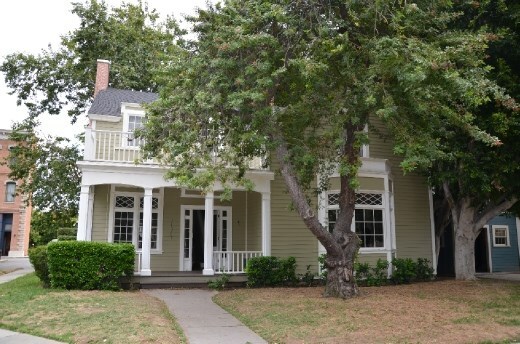 We went to two: 2 Broke Girls and The Fosters. 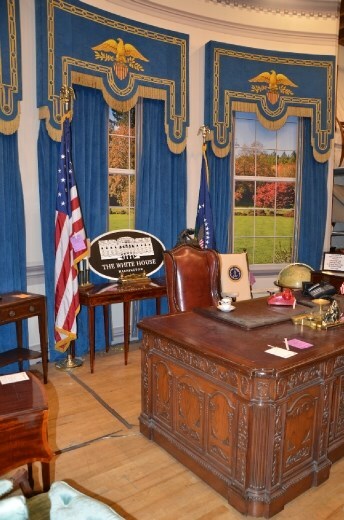 The sets were pretty cool and very realistic. Unfortunately we were not allowed to take photos; just watch the shows, you will see what we did. Moving along we visited a Harry Potter exhibit. Although filmed in the United Kingdom, WB bought the rights to Harry Potter long before the story became famous; pretty good investment! 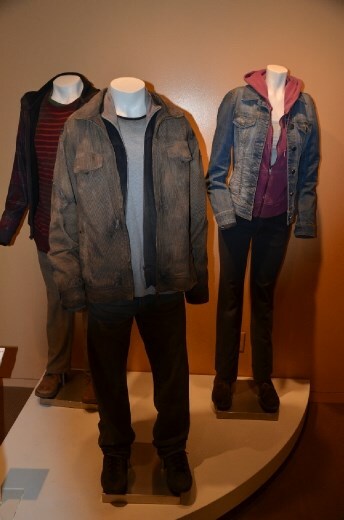 The exhibit was mainly composed of items from The Chamber of Secrets, the second in the series. The authentic costume were incredible. 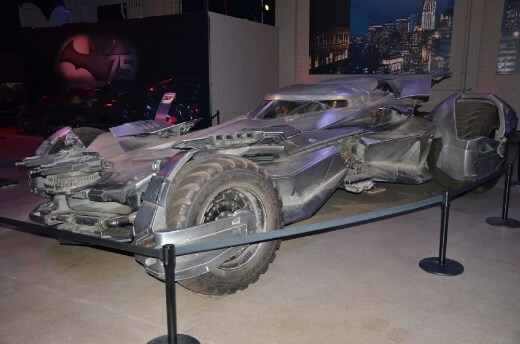 The second exhibit we view was the Batman vehicle 'shed'. 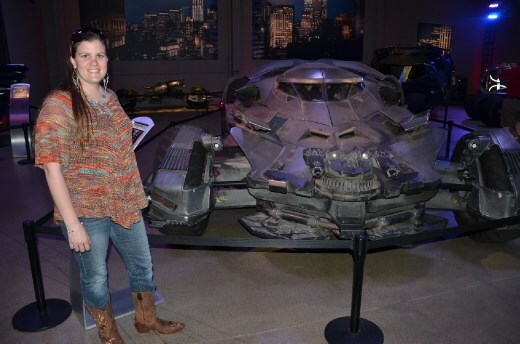 Full of original Bat-mobiles, the room was very cool and a true Batman fan would have been in awe. Passed through the set building area. The last stop was the prop building. This huge warehouse was absolutely jammed packed with everything from lights, couches to presidential furniture. We saw many recognizable items! Tim loved the props from the Matrix, all filmed here. 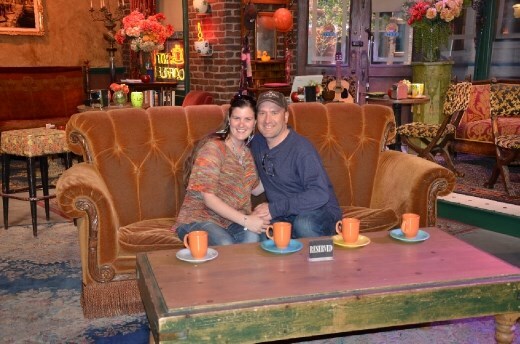 They also had the coffee shop scene from the show Friends that you could sit on the "famous" couch and get your picture taken; so, of course, we had too. 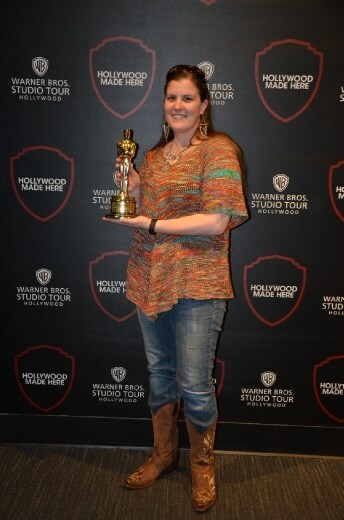 I got to hold a real Oscar, just for taking the tour. Although I had to remove my rings, all I can say is it was heavy and I didn't even have to act to get it. 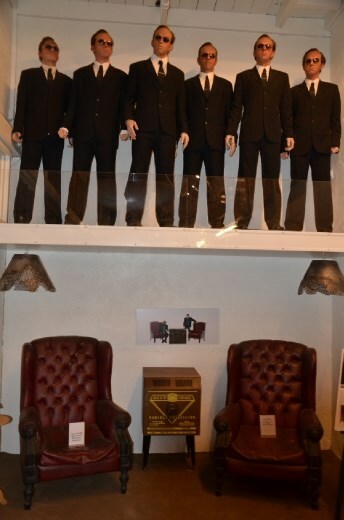 There was so much to see on this tour that the blog cannot really do the experience justice. 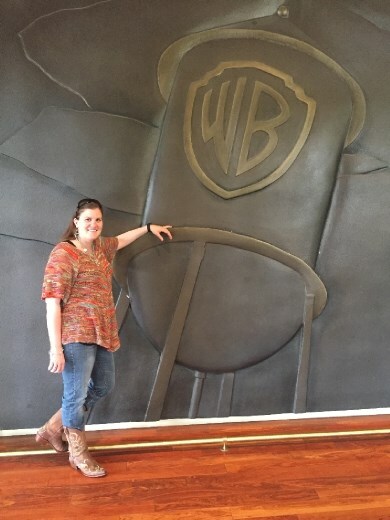 From super heroes – many mentioned, to real heroes such as Chris Kyle (US Navy Seal; American Sniper); The Warner Brothers Studio was an exceptionally good experience. Even worth the 2 hour drive through rush hour traffic back to our hotel. There are so many more pics from this trip in the Gallary, take a look, its worth the trip!